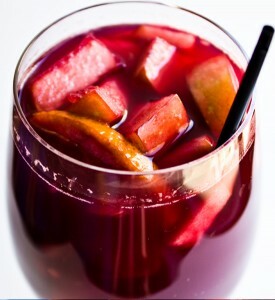 There’s just something I find hard to resist about sangria – wine and fresh fruit are just my jam. It is the double-threat–a drink and boozy fruit salad all in one. Cut up the fruit and toss in a pitcher. Pour the coconut rum and red wine on top and stir. Cover and let it set in the refrigerator (preferably overnight). 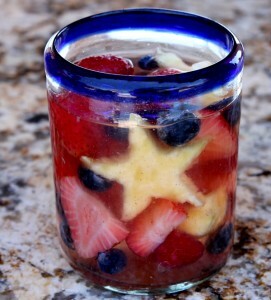 Pour over ice and top with a splash of club soda for a little sparkle. Add more wine if you run out. This should keep for at least three days. 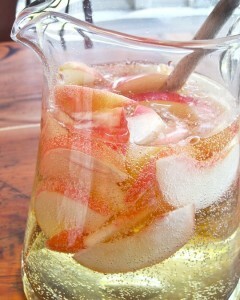 Slice the Peaches, muddle the Raspberries and combine with the Peach Brandy in a pitcher. Let it set for 15 minutes and then add the Moscato. Stir and refrigerate for a few hours. Pour over ice and top with club soda. Combine everything into a pitcher, cover, and refrigerate for at least three hours. Pour over ice.